Pregnancy and childbirth are a rollercoaster ride like no other. But, you know that you have hopped off once your old friend, the period comes back. If you haven’t got this demanding little miss back in your life yet, read on to know when you can greet her again and what you can expect from your first period after childbirth and the effect on your fertility. The one hormone that affects the return of the period is prolactin. This hormone enlarges your breasts during pregnancy and stimulates milk production after childbirth. It also hampers the production of estrogen and progesterone, the female fertility hormones which suppresses ovulation and the menstrual cycle after childbirth. More prolactin is produced by your pituitary gland, the longer you breastfeed. If your baby suckles at your breast frequently, the greater the amount and frequency of prolactin produced. The level of prolactin determines when you will get your first period after pregnancy. When can you expect your period after delivery if you are breastfeeding? If you are exclusively breastfeeding your baby, your period can be back 6–8 months after delivery. You may not have your periods until you introduce the bottle or solid foods for your baby. When can you expect your period after childbirth if you are bottle-feeding? If bottle-feeding even partially, you may get into the flow much earlier- as early as a month after childbirth. This happens because the prolactin levels return to pre-pregnancy levels within 2–3 weeks of childbirth and this can lead to a period after just 4 weeks post-delivery. Avoid using tampons during your first menstruation especially if you had a normal vaginal delivery. Is bleeding or spotting for a few days after delivery a period? 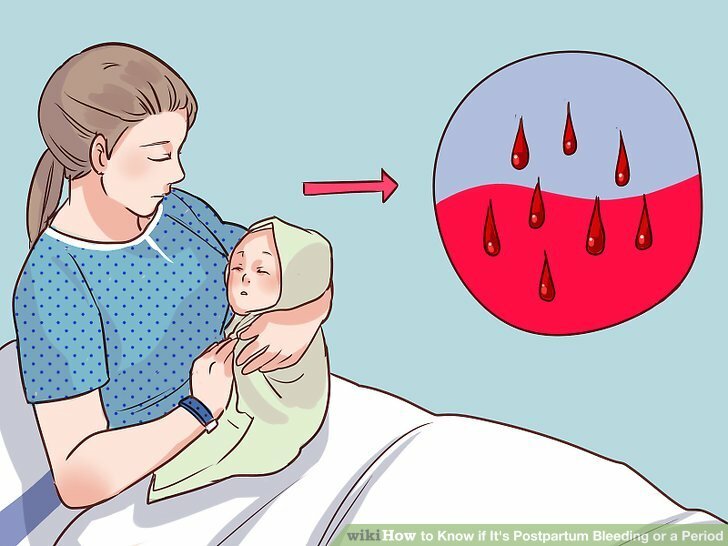 It’s normal to bleed for the first few weeks after delivery. But, this is not a period. This bleeding is a normal discharge that contains blood, mucus, and uterine tissue and this is how your body sheds the blood and tissue that lined your uterus while you were pregnant. This happens whether you have a normal delivery or a C-section. The blood might be heavier and in clots for the first few days. But, in a few days, this blood gives away to a vaginal discharge known as lochia which is clear to creamy white in colour. It can continue for about 6 weeks and in this period your period can return if you aren’t breastfeeding. If you get bleeding after lochia, this is likely due to menstruation. These are red flags that should take you to your doctor immediately. Do consult your gynaecologist if you notice any greenish colour or an unusual smelling lochia as these may be signs of an infection. Are your periods after childbirth different from the periods before? These usually settle in the next few months as you continue your cycle. Is birth control needed during breastfeeding? Breastfeeding is a natural birth control method as you don’t ovulate. But, it’s by no means an absolute guarantee you won’t get pregnant again. It has just about 98 percent reliability as a method of contraception in the first 6 months after you give birth. -She is continuously and exclusively breastfed which means that you breastfeed every 6 hours and you nurse your baby only at the breast and not by pumping milk from your breast. If you are not doing the above, you are not protected against another pregnancy and you could get pregnant even before your periods resume after childbirth. Why this happens is because your ovaries release an egg about 2 weeks before you get your period. This means that are actually fertile again even before you resume menstruation after childbirth. Another reason you need contraception during breastfeeding is that you are still at risk for getting STDs. So, it’s best to ask your gynaecologist about an effective birth control method and protect yourself from an unplanned pregnancy and STIs, both. Shikha Gandhi is a health journalist and a short film maker. She is also a certified Pranic healer and a lover of long walks.